Since the fusion of Eurofins Genomics and GATC Biotech last year, we have reached several milestones, such as providing you with one single sales contact for all Eurofins and GATC products. In recent exhibitions such as Analytica, we welcomed you at our joint booth, where you had the chance to meet our genomics experts and discuss with them how we can help you solve your DNA-related challenges. As a next step, we will very soon combine all our products in one joint web shop. 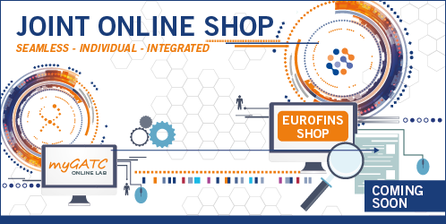 Going forward, you will be able to order all GATC products online from the Eurofins Genomics web shop. This will not only include the Sanger products like SURPREME RUN or LIGHTRUN and the MYCOPLASMA CHECK, but it will also make all GATC NGS products available for easy ordering online. To make this transition smooth and seamless for you, your barcodes, data, custom prices and settings from myGATC will all remain available in the new environment. You will keep your myGATC login, which will then also work for the Eurofins Genomics web shop. If you already have an account in both web shops, we offer you to merge the information stored in myGATC with your Eurofins Genomics account to give you the full transparency on your orders, quotes and available barcodes. Of course, you can continue to use your GATC barcodes; all of them will remain valid. Within the Eurofins Genomics web shop, you will find valued features like the GATC barcode management tool together with new tools like group functions to share data and sequencing primers. For the time being, we will also keep all Collection Points as they are today. We will inform you once we merge our networks here, too. We will keep your custom prices and we will make your customer benefit accounts (CBA/KVK) available within the Eurofins Genomics environment. This will allow you to not only pay GATC services with your deposit, but flexibly use it for all Eurofins services as well. Eurofins customers with an EVOcard can of course use it equally flexible for GATC and Eurofins products in the future. In addition, we will include all GATC NGS products – INVIEW, NGSelect and GATC Liquid – in the Eurofins Genomics web shop. They will be fully orderable online, which is unique in the market. Stay tuned for the launch date of our joint web shop and a more detailed introduction of the exciting features to come! You do not know the Eurofins Genomics web shop yet? Then we encourage you to visit www.eurofinsgenomics.eu to explore it already today. If you have questions, check our FAQ section or ask us. Our sales and support teams are happy to assist you!